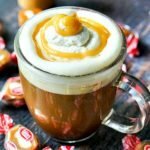 If you are looking for something special to sip this fall, try this salted caramel cream coffee. All the creamy sweet flavor of those classic candies in a low carb, sugar free coffee! In a medium skillet, melt the butter and whisk until a light brown color. Add in the cream and sweeter and simmer for about 10 minutes until it reduces and thickens. Pour into a container and set aside for later. Refrigerate after using. Make sure to shake well before using if it's in the refrigerator. You might even have to warm it a bit in the microwave. Just about 10 seconds and then shake well. Add the cream and s'mores syrup to a mixing bowl. Beat on high until thick and creamy and forms peaks. Add the salted caramel syrup to the coffee and mix. Spoon or pipe whipped cream on top and then drizzle some of the caramel sauce. NOTE: The caramel sauce makes 4 tablespoon servings total so you will have extra. The whipped cream will make roughly 2 cups of whipped cream so you will have plenty left over of that as well.